A North America native plant, the guara whiskers deep rose flower is valued for it’s lengthy floral display. It flowers through the entire summer and fall with sprays of large, rosy-pink flowers on wiry stems. These flutter in the wind creating the impression of a cloud of tiny butterflies. The flowers have white stamens that have a cunning resemblance to whiskers. The whiskers deep rose adds a delicate touch to your garden and are perfect for cut flower arrangements, garden beds, landscaping, edging, as a border plant, and even planting in containers, thanks to its compact habit. It grows to about 14-16 inches tall, and 12-14 inches wide. This wand flower care needs are minimal. It is heat and drought tolerant and needs very little soil moisture to grow. They love the sun and should therefore be planted in full sun or partial shade. Normal or sandy soil type is good for it but should be well-drained for the plant to survive the winter. Gaura pruning can be done in two stages: in mid-summer when flowering declines, cut back by half to encourage a bushy growth and a second blooming. In spring, cut back just before new growth appears. Other guara plant varieties are the guara biennis a tall variety that grows 3-6 feet high, and guara lindheimeri, a drought tolerant Texas native. 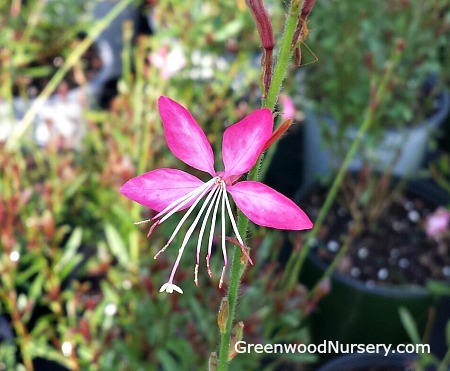 Gaura Whiskers Deep Rose is grown in a one gallon pot. Orders shipping to CA or AZ may be bare rooted before being prepped for shipping.